Patroness of Paris, b. at Nanterre, c. 419 or 422; d. at Paris, 512. Her feast is kept on 3 January. She was the daughter of Severus and Gerontia; popular tradition represents her parents as poor peasants, though it seems more likely that they were wealthy and respectable townspeople. In 429 St. Germain of Auxerre and St. Lupus of Troyes were sent across from Gaul to Britain to combat Pelagianism. On their way they stopped at Nanterre, a small village about eight miles from Paris. The inhabitants flocked out to welcome them, and St. Germain preached to the assembled multitude. It chanced that the pious demeanour and thoughtfulness of a young girl among his hearers attracted his attention. After the sermon he caused the child to be brought to him, spoke to her with interest, and encouraged her to persevere in the path of virtue. Learning that she was anxious to devote herself to the service of God, he interviewed her parents, and foretold them that their child would lead a life of sanctity and by her example and instruction bring many virgins to consecrate themselves to God. Before parting next morning he saw her again, and on her renewing her consecration he blessed her and gave her a medal engraved with a cross, telling her to keep it in remembrance of her dedication to Christ. He exhorted her likewise to be content with the medal, and wear it instead of her pearls and golden ornaments. There seem to have been no convents near her village; and Genevieve, like so many others who wished to practise religious virtue, remained at home, leading an innocent, prayerful life. It is uncertain when she formally received the religious veil. Some writers assert that it was on the occasion of St. Gregory's return from his mission to Britain; others say she received it about her sixteenth year, along with two companions, from the hands of the Bishop of Paris. On the death of her parents she went to Paris, and lived with her godmother. She devoted herself to works of charity and practised severe corporal austerities, abstaining completely from flesh meat and breaking her fast only twice in the week. These mortifications she continued for over thirty years, till her ecclesiastical superiors thought it their duty to make her diminish her austerities. Many of her neighbours, filled with jealousy and envy, accused Genevieve of being an impostor and a hypocrite. Like Blessed Joan of Arc, in later times, she had frequent communion with the other world, but her visions and prophecies were treated as frauds and deceits. Her enemies conspired to drown her; but, through the intervention of Germain of Auxerre, their animosity was finally overcome. The bishop of the city appointed her to look after the welfare of the virgins dedicated to God, and by her instruction and example she led them to a high degree of sanctity. In 451 Attila and his Huns were sweeping over Gaul; and the inhabitants of Paris prepared to flee. 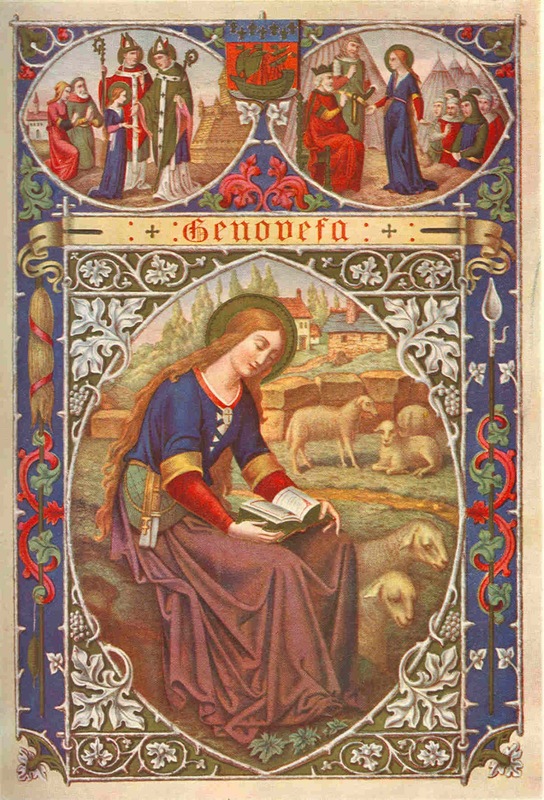 Genevieve encouraged them to hope and trust in God; she urged them to do works of penance, and added that if they did so the town would be spared. Her exhortations prevailed; the citizens recovered their calm, and Attila's hordes turned off towards Orléans, leaving Paris untouched. Some years later Merowig (Mérovée) took Paris; during the siege Genevieve distinguished herself by her charity and self- sacrifice. Through her influence Merowig and his successors, Childeric and Clovis, displayed unwonted clemency towards the citizens. It was she, too, who first formed the plan of erecting a church in Paris in honour of Saints Peter and Paul. It was begun by Clovis at Mont-lès-Paris, shortly before his death in 511. Genevieve died the following year, and when the church was completed her body was interred within it. This fact, and the numerous miracles wrought at her tomb, caused the name of Sainte-Geneviève to be given to it. Kings, princes, and people enriched it with their gifts. In 847 it was plundered by the Normans and was partially rebuilt, but was completed only in 1177. This church having fallen into decay once more, Louis XV began the construction of a new church in 1764. The Revolution broke out before it was dedicated, and it was taken over in 1791, under the name of the Panthéon, by the Constituent Assembly, to be a burial place for distinguished Frenchmen. It was restored to Catholic purposes in 1821 and 1852, having been secularized as a national mausoleum in 1831 and, finally, in 1885. St. Genevieve's relics were preserved in her church, with great devotion, for centuries, and Paris received striking proof of the efficacy of her intercession. She saved the city from complete inundation in 834. In 1129 a violent plague, known as the mal des ardents, carried off over 14,000 victims, but it ceased suddenly during a procession in her honour. Innocent II, who had come to Paris to implore the king's help against the Antipope Anacletus in 1130, examined personally into the miracle and was so convinced of its authenticity that he ordered a feast to be kept annually in honour of the event on 26 November. A small church, called Sainte-Geneviève des Ardents, commemorated the miracle till 1747, when it was pulled down to make room for the Foundling Hospital. The saint's relics were carried in procession yearly to the cathedral, and Mme de Sévigné gives a description of the pageant in one of her letters. The revolutionaries of 1793 destroyed most of the relics preserved in St. Genevieve's church, and the rest were cast to the winds by the mob in 1871. Fortunately, however, a large relic had been kept at Verneuil, Oise, in the eighteenth century, and is still extant. The church built by Clovis was entrusted to the Benedictines. In the ninth century they were replaced by secular canons. In 1148, under Eugene III and Louis VII, canons from St. Victor's Abbey at Senlis were introduced. About 1619 Louis XIII named Cardinal François de La Rochefoucauld Abbot of St. Genevieve's. The canons had been lax and the cardinal selected Charles Faure to reform them. This holy man was born in 1594, and entered the canons regular at Senlis. He was remarkable for his piety, and, when ordained, succeeded after a hard struggle in reforming the abbey.